The North Maine Woods is some of the most remote land in the entire state of Maine. The Katahdin Woods & Waters National Monument was created to protect this wild landscape for locals and visitors alike. Designated in 2016, Katahdin Woods & Waters National Monument preserves 87,563 acres of land in rural Maine. Adventurers looking for a true sense of remoteness have been discovering the serenity of this national monument, and singing its praises. The National Monument borders Baxter State Park, offering outdoors enthusiasts plenty of opportunity to explore Maine's protected wilderness. The Katahdin Woods & Waters Scenic Byway offers 89 miles of roads to experience the National Monument. Natural highlights along this route include scenic views of Mount Katahdin, wildlife, hiking trails, paddling, camping, waterfalls, and fall leaf peeping. Many people also stop at the Patten Lumbermen’s Museum, Shin Brook Falls, and the Ambejejus Boomhouse. 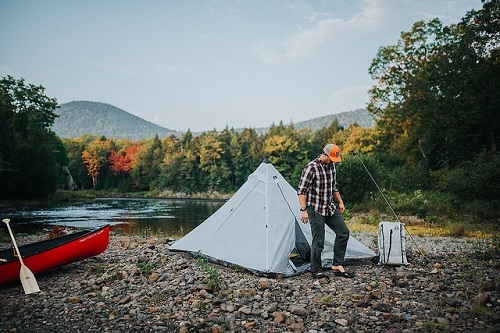 The East Branch of the Penobscot River winds through the Katahdin Woods & Waters National Monument, offering excellent fishing, canoe trips, and whitewater rafting. From vistas and views, bald eagles and moose, to paddling and hiking adventures, the Katahdin Woods & Waters National Monument is an untouched region just waiting to be explored. We urge you to take a few moments and watch this video of four Maine photographers hiking, biking, and paddling their way through this unspoiled region of Maine. We hope it sparks adventure!